The Swamys have three children. Son Ravi and daughter Priya are doctors, and Nithya, the youngest, will be one soon. She is in medical school at the University of Chicago, and Ravi is at Stanford doing a residency in plastic surgery. Priya, a Harvard graduate, is a dermatologist on the faculty at her alma mater. Sara had told them to go wherever they wanted, but always urged them to come home, to come home because the best people in the country were here, and when all is done, they very well may do just that. They learned about Grayson County in 1974, when they received an invitation from Jerdy Gary, the mayor of Denison and chairman of the Texoma Medical Center board of directors. Sara was recruited to work with Dr. Don Freeman, a pediatrician who was ready to slow down a bit, and Sam would be the only plastic surgeon between Dallas and Oklahoma City. The young physicians decided to visit. A reception was held in their honor, and they were overwhelmed with the kindness shown. That dedication to family was made known to Sam during their engagement. She told him that when he married her, he would be marrying her mother and siblings as well. When she got her first paycheck for $120, she sent money home. Sara grew up in Coimbatore, India. The oldest of four children, she took responsibility for her family when her father died of esophageal cancer. Had she followed the custom in India, she would have married soon after his death. Instead, she applied and was accepted to medical school, secured a loan for her education from a local bank, and started classes at 15. She became a medical doctor at the age of 20. 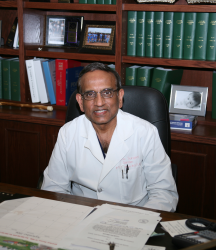 Dr. Swamy in his private office at the new Sara Swamy Memorial Surgery Center in Sherman. Sam agreed. “Sara had an innate ability to look at children—to gauge their way of breathing—and to know what was going on. She knew what pertinent questions to ask and made good, quick diagnoses. Even if a child came in with nothing but a sore throat, she would do a complete exam to be sure she didn’t miss anything. It was her caring nature.” She treated the children and educated their parents. Sam acknowledged that she wanted to alert them to what symptoms to watch for in a child with acute illness. She taught them how to observe and care for the children so that problems were caught early. Sara’s talents weren’t limited to medicine. Because she was never thwarted by a challenge, she tried and accomplished a great many things. She was named best athlete in medical school. She was elected homecoming queen. She could grow a variety of plants. She once installed a sprinkler system after reading a how-to book. Sam said, “She could figure out how to do anything, and then she did it.” Nithya echoed her father’s words. “My mom was the kind of person who could handle anything and manage it flawlessly. She was not afraid of anything and would approach everything she did wholeheartedly. Sara was a visionary with the business acumen to make astute investments. Sam Henry had a long-lasting business relationship with Sara through Chase Bank. “She had an amazing mind and was able to study the stock market or the real estate market and make sound decisions,” the banker said. “She could be tough in her business dealings, but was always fair and would really dig in and understand the issues. I had such respect for her and her ability to keep track of so many different things and do well at each.” Those varied talents eventually resulted in the plans for a new clinic, which Sara and Sam were to share. At the time of Sara’s death, the clinic was only about a third finished. Sara had been the mastermind behind the project. 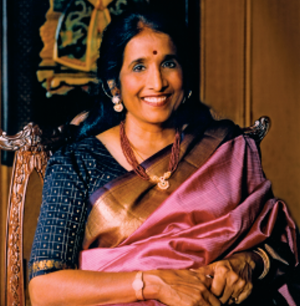 She had selected the site on a street now named Sara Swamy Drive, purchased the land, hired an architect, helped design the structure, determined the landscaping, and chosen the furnishings. An interior hallway holds a gallery of family photos, including early marriage snapshots showing a handsome couple obviously in love. Her mark is clearly evident from the strategically placed doorway and office suites on the east side (an assurance of good luck in India) to the many details ensuring patient comfort. And typical of Sara’s consideration for Sam, she insisted on a garage. She told him she didn’t want him to get wet in the rain or feel cold in the winter. On September 6, 2005, the Sherman City Council passed Resolution No. 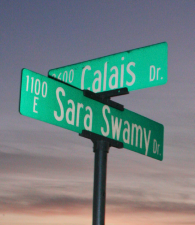 4719 renaming Heritage Park Drive, Sara Swamy Drive. Sara’s office is maintained as it would have been had she lived, except neater, according to Sam. There are framed photographs of children and grandchildren. Her degrees placed unobtrusively on the wall. There is a shadowbox containing scissors and a ribbon from Medical Plaza’s opening. There are flowers. There are awards. “She wouldn’t have wanted the awards on the wall.” Sam said. In the area outside the surgery wing, Sam lovingly displays a large framed picture of a surgeon at work on a patient, with Jesus standing so close that His hand is resting on the surgeon’s shoulder. Sara gave it to Sam just before she died. What would Sara say now that the building is finished? “She would appreciate me and say ‘Sam, you did a good job’,” he answered. In addition to her aspirations for the clinic, Sara had a substantial role in building the Hindu Temple in Dallas. She actively volunteered at the Indian clinic there. She was a supporter of the Crisis Center, Austin College and the Salvation Army. In fact, Sam said, she took great pleasure in “dragging” him out to ring the bell in front of WalMart every Christmas! It was part of her desire to give something back to a generous community who had welcomed her and Sam at a time in their lives when they had very little. Nithya recalled that her mother wanted each of the children to experience as much as possible from education, music, dance, and sports. She set aside time to take each of them to lessons and to attend their recitals or events. “I remember countless times when my mother would give up what she was doing to be with us,” said Nithya. 1. “Relationships are vital. You should always be there for family and friends, as they will be there for you. Take care and learn from each other. It will only make you a better human being. 2. No challenge is too great. Never give up. You can do anything that you set your mind to. When Sara wasn’t busy being a wife, mother, doctor, or volunteer, she gardened. She loved flowers; especially roses. Sam said she could get lost in her garden and she treated the flowers like beloved children. With others, she was an easy mark. “Tell her a silly joke,” said Pryia. “She laughed most at the simplest of jokes,” Laughter, everyone in her family remembers the laughter. Sara’s sense of urgency was ever-present. Once she decided to do something, she’d start right away. Sam would encourage her to rest and put her feet up, but she wouldn’t listen. “It is almost as if she had some intuition about the length of her life and didn’t want to waste any time,” Sam said. He recalled that she could watch a three hour movie in 30 minutes by fast-forwarding. Despite viewing the condensed version, she didn’t miss a thing. Sam intends to continue working toward Sara’s dream of building a school in Coimbatore. She wanted to add a high school to the middle school. She was preparing to purchase the land and build a small free clinic. She wanted to set up a foundation so people in need could receive good medical care. Sara was described as the rock for her family, being present for them, always lending a helping hand, willing to listen or offer sensible advice. She asked her family to watch out for one another and take care of each other. If Dr. Sara Swamy were present, she would quickly redirect the focus of this story to her family. Of all her accomplishments, their success is what she would have deemed most significant. It is that generosity of spirit and unquestioned priority that endeared her to so many and made her contributions to our community so deeply appreciated. She leaves behind a legacy of love and service. And, of course, grandchildren, who perhaps will, grow up to save lives and install sprinkler systems with the zest and skill of their grandmother. Dr. Swamy’s death is such a tremendous loss for this world. It saddens me, so greatly, to hear of her premature passing away. Dr. Swamy was my daughter’s pediatrician beginning in 1980. She was wonderful and reassuring and known for her ability to diagnose. I chose her because she was a pediatric heart specialist and I had two brothers who were born with heart murmurs so I wanted a specialist for my baby when she was born. Once I took my baby in for a check up and Dr Swamy took a look at her and exclaimed, “your baby is orange!” Dr. Swamy advised me I had not been giving her enough green vegetables! When our daughter was almost three I took her to Dr Swamy because she was coming down with a cold. I wanted her well for the birth of her brothers (twins) who were due in three weeks. Dr. Swamy looked at me and said, “tell Dr. Bullock to take those babies now!” I didn’t take her literally but I wish I had. Our sons were stillborn on December 23. I called Dr Swamy after I went home and she asked why she hadn’t been called when I went into labor. I really didn’t know the answer. She was almost as upset as I was. We moved to Arlington when our daughter was almost five. Our daughter was sick a lot during her kindergarten year. We could not get her well so I took her back to Dr Swamy in Sherman and Dr Swamy had us take her to an allergist. We had her tested and and that was the source of her problems. I used to think there would never be another Dr like Dr. Swamy. After reading this article about her children, I may change my mind.